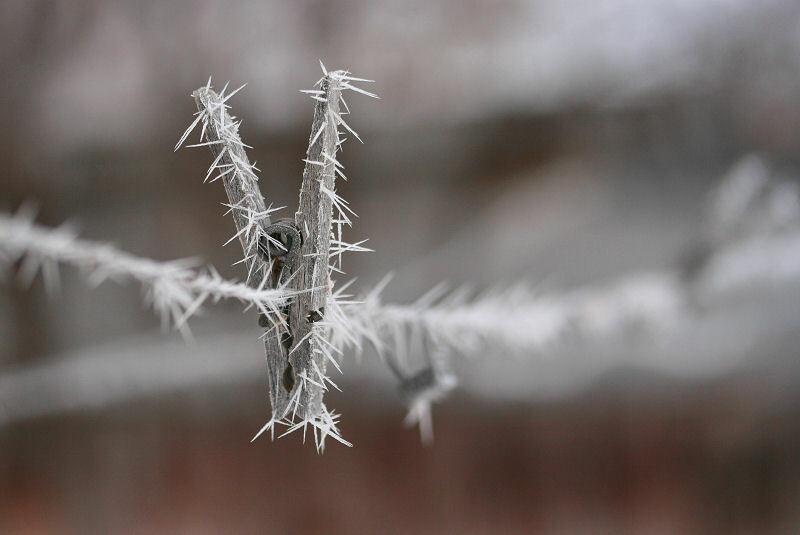 Under clear frosty nights in winter, hoar frost is characterized by the soft ice crystals that form on vegetation or any object that has been chilled below freezing point by radiation cooling. This type of frost can sometimes be so thick that it looks like freshly fallen snow. The interlocking ice crystals become attached to branches of trees, leafs, and grass blades and are one of the most prominent features of a typical 'winter wonderland' day. However, the fine 'feathers', 'needles' and 'spines' might also be found on any other object that is exposed to supersaturated air below freezing temperature. This is nicely composed. DOF and selective focus are well chosen. Awesome find and image..very unusual! Absolutely beautiful in its resplendent glitter. A clothespin necklace ornament!! Very nice shot, excellent composition.